In order to process all I have experienced and learned over the past sixteen weeks, I must reflect on my personal observations and notes, blogs and suggestions provided by my superiors and peers. As this semester is wrapping up I am pleased with my progress in the classroom. I know I have so much to learn and try before I will develop into the teacher I envision but I am confident I am on the right path to succeed. I feel two goals is achievable due to their tracking abilities, my resources, and my desires to be an effective and productive teacher. I look forward to tracking my progress with you next semester! For my second observation, I had my peer observe my second attempt at the subject-verb agreement lesson. I went into the PM class lesson with my CT and professors tips and suggestions still fresh in my mind. I penned in a few edits and adjustments to my lesson plan and felt much more confident this round. After lunch the students are usually running on high energy and want to discuss what happened during specials and lunch. This has been a challenge for me to bring them back and settled and ready to learn. My peer noticed this too. I circulate and say let’s wrap up our conversations and begin our dictation. I try to remember how much time students spend not talking throughout the day and be flexible during transitional periods. As I’m preparing for my full-time internship in the Fall I started thinking about a better way to bring the students in the classroom and back to their seats and ready to learn run more efficiently. I want to try and have students walk in and have a procedure such as have a sip of water, pick up your dictation journal and return to your seat. I think having a talking distraction such as taking a sip of water will help students separate from the conversations that take over. Obviously, no one would be forced to drink but something along those lines. Another idea would be to encourage a quick transition back to their desk by letting them pick the sentences to correct or maybe earn a 3 minute game of Simon Says or 3 minutes of doing Kids Zoomba to help combat extra energy and have students learn the benefits of working towards a goal. Another area of improvement was that the more educated I am on a subject matter, the more confident and informed I will be for the students. During the lesson, a misconception was addressed and I wasn’t able to articulate a rationale behind the irregularity so I told the students let’s use Google and see if we can find out. While this was a good way to model what to do when you’re unsure of something it also took a few minutes out of the lesson. Basically, that is a great thing to do when time or content permits but it’s not always the best use of time. The only way to combat this is plan a few weeks ahead and then become an expert in the field by research, asking colleagues and consulting other resources such as team leads and coaches. All in all, I’m feeling much more in the groove because while nothing has been flawless (not even close to flawless) I now have a direction and goal I’m seeking. I must put it into action and track my findings in order to assure I’m growing into the teacher I desire to be. It has been one week since my last observation and going in to this one, it felt much more purpose-driven. I knew specific areas in which I hoped to improve on. This made lesson planning feel less stressful. Knowing what works and hasn’t worked for me makes it easy to ask my peers, CT, and professors for specific-content and/or behavioral skills insight. While the lesson planning went better than my previous attempts, my play-by-play dialogue still had many holes in it. Over the summer, I am going to play with different layouts and lesson plan templates to find one that might better suit my speaking skills. I’m surprised it took me this long to think about doing that. After all, I’m in a program that encourages teachers to let students complete their work using mediums, such as graphic organizers, that best suit their learning style instead of enforcing one universal way of learning. Of course, all of the templates in the world will not perfect a lesson without investing the time, knowledge of your students and energy into creating them. My CT and I decided to do a co-teach model (of course, she was able to wing it, but in hindsight I should have included prompts for her in my lesson plan). It is very helpful to me to have someone who is able to “pick up the slack” during the lesson. What she adds to the lesson and especially during times when I’m stuck or unsure of how to move forward, she steps in and lightbulbs go off in my head! It is almost more beneficial to me then the post-observation reflection session because I’m immediately given “feedback” in real time. I’m going to make a habit out of immediately jotting down these “insider” tips after the lesson otherwise they get lost in passing. – Keeping an eye on the whole class. I tend to focus on the perimeter students, or students who tend to have behavioral issues. I need to remind myself during my teaching to do this. I can write a reminder on my student list and antedotal clipboard. – Forgot to read instructions – As a student, I know I need directions in order to know what to do so I need to slow down and follow my plan to make sure I don’t forget something as obvious as this. My semester reflection will include more improvement plans and suggestions that are beginning to really click and work for me as a developing teacher! With so many lesson planning resources available at my fingertips you would think creating an authentic lesson plan would be quick and “easy” to complete. For me, my drafts seem to be generic and dull. I decided if I wanted to peak our students learning I would need to seek out the help of all the resources we have available. I first had the feedback from my professor which helped me recognize the gaps and flaws in my first draft. I followed those corrections with the help of my CT who provided me with the LAFS iReady workbook. The workbook helped me guide my lesson to be better aligned with the standards and more purpose-driven. Moving forward I will remember the success (which I hope is proportionate to my experience) I had in creating this lesson plan. I will know that the planning portion of a lesson makes every difference in the world and that it usually (especially with teachers and preservice teachers at a novice level) takes a team to construct the most effective lessons. I look forward to building my own library of lesson plans as student/classroom specific modifications will be much less time consuming and more effective in terms of learning. The first lesson, during AM Class, was pretty well controlled in terms of behavior management. The students appeared to be responsive to my instruction but I cannot say with any real certainty that the students have furthered their knowledge on sequence of events and its use and value. This is where assessment must be implemented. While my plan included means of measuring student(s) learning and progress before, during, and after the lesson the actual implementation of assessment was not applied. I know I need to improve my formative assessing skills. I will start by making sure I have a clipboard with a list of student names on it and a chart in which I can quickly jot down any misconceptions, understandings, etc. which will overall help shape my instruction and awareness of my students needs. In addition, I need to work on improving my HOT questioning skills. It was brought to my attention that after asking questions I rarely give students the opportunity to answer them. Sometimes I think its my nerves and adrenaline that rush me past it and at other times its my fear of not knowing how to guide their thinking back on track. By using the same resources and seeking ideas of peers and superiors and experts in the field I can practice becoming more question-savvy and help guide my students higher order thinking skills. Next, week I’ll update the status of my video recording reflection and my peer observation results and projected goals. I know we covered the experience of my first time being formally observed by my MAT Professor last week so now I would like to share how my peer observation helped me acknowledge areas of improvement I should be focused on. There are several notable differences that exist between my peer and superior observations. The first being that during my peer observation I was mimicking a guided lesson my CT had just modeled for me. When I was observed by my professor I was responsible for creating and implementing my own guided lesson plan. So my confidence level was most certainly higher during my peer observation. What I know now is, it all boils down to how many experiences teachers have in the classroom that give them the confidence they need to know the choices they make are effectively helping their students develop into higher order thinkers and doers. My peer observer really hit the nail on the head recognizing my uncertainty! Its something I can definitely say I have been focusing on and feel strongly that I’m getting more comfortable and content with myself. I will continue thinking of HOT questions I can use when lessons take a different direction then I initially intended upon happening. All in all, I find value in working with my peers who can provide me with a perspective I may have otherwise missed out on. Last week I experienced a busy return back to normal routines after what seemed like weeks of practice FSA exams falling on the days I spent in the classroom. In a slight role reversal, this week, I would be the student showing herself and teacher(s) what I can do as a teacher. Made it through without any major management issues — yes, that was a fear of mine! Time management skills — I always knew this would be a struggle for me as a beginning teacher. Some steps I will take to fix this is to plan LP using specific step by step plan with corresponding time referenced and to train myself on becoming more aware of how I distribute my time during the lesson itself. My confidence — Honestly, its just a matter of time and practice. Level of conciseness — At times, it is important to be overly repetitive and even elaborate and at other times it is best to provide short and specific direction. I have to make step-by-step, quote-by-quote guidance in my LP to help keep me on track. It’s a funny thing for me to realize this was my first formal observation but my future holds so many more of them. I hope I will develop into the teacher I envision and when I’m observed I’ll have the confidence I need to make it through! 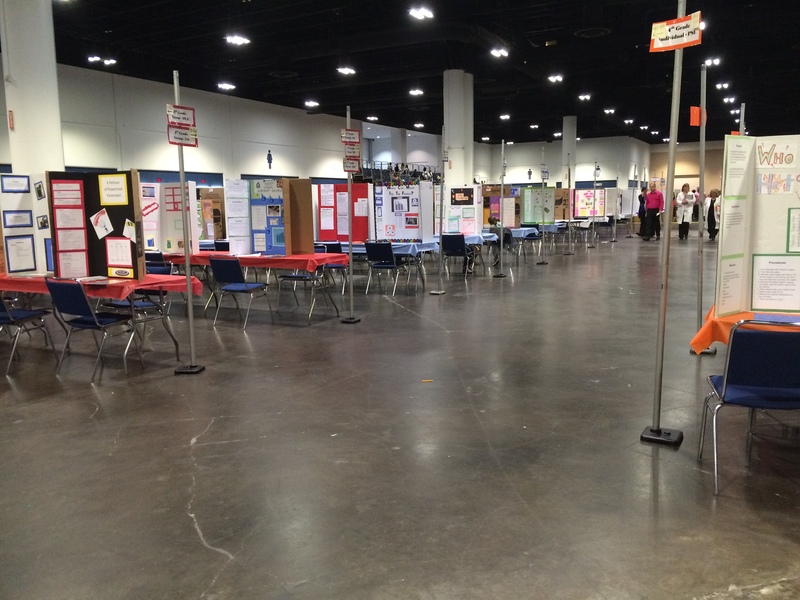 Last week I was lucky enough to serve as a judge for the county’s STEM fair. This included all grades and forms of science categories. The students present were selected from their respective schools and sent to county with the hopes of making it to the state rounds. Upon arrival I was assigned to forth grade Physical Science – Matter category. A fairly large category on a comparative level of the others. I was partnered with another intern and a retired science teacher who has been a judge for the past seven years. As a team of three were assigned ten students to review. The first thing I learned is that we cannot ask for their name or the name of the school they attend to prevent any favoritism that may affect the judging of the projects. The second thing I learned is that students are not aloud to engage in projects/investigations that produce the growing of mold; however, if by default it happens that is acceptable. I was surprised by this rule as it seems to limit students creativity and options to explore science. As we approached each student their personalities made such a difference in what and how we learned about their investigations. Some seemed like authentic kiddish projects such as which paper makes the best paper footballs or the projects involving candy. Other investigations made me think “I bet this was their parents idea” but maybe I was being overly cynical and even if it was their parents idea if they followed through with it I should not judge them on whether the idea was from them or not. 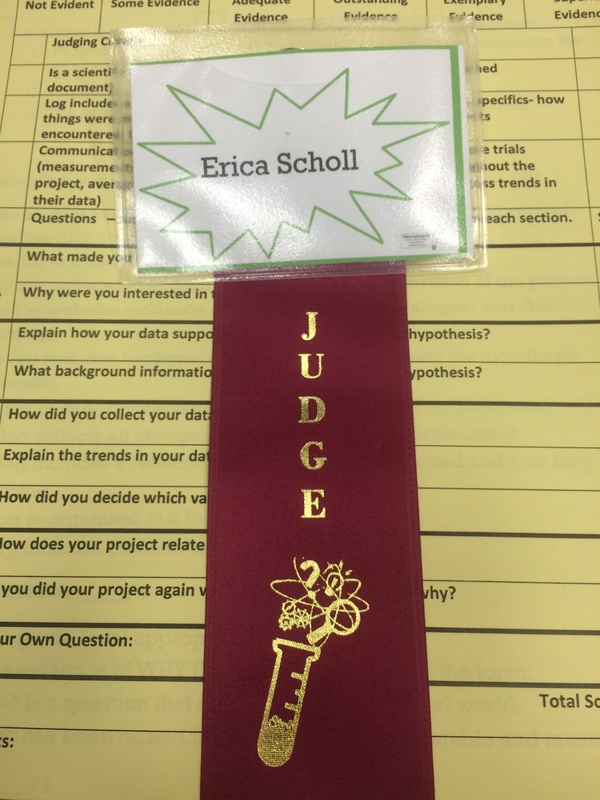 In the picture above and to the left you will see these snazzy judge name badges we were provided as well as a sample evaluation chart used to guide questioning and scoring. To the right is about a quarter of the projects that were presented onsite. I was impressed with number of participants and the amount of family support that showed up. Events like this are great ways to incorporate family and learning with the student. All in all this was a great experience for me to partake in! The more I participate in the math and sciences the more I think I could make a good teacher in subjects other than ELA. During my experience in the classroom over the past two weeks I was forced to face the undeniable truth that teachers and students often lose valuable learning opportunities because of administrative tasks. During week one I assisted in proctoring the FSA ELA practice test number two and this week parent/teacher conferences were held. In the following I will discuss what I observed and learned in terms of teacher responsibility and administrative requirements. FSA – Practice Exam #2: The district highly recommends school participate in FSA practice exams and at the school where I am they agree. As do I! What did surprise me was the fact that some schools would object to administering practice exams. I know it takes away from learning time but learning the skills of test taking, especially lengthy high-stakes testing, should be viewed as equally important. The test took a total of seventy minutes to complete. That amount of time requires a lot of stamina and motivation to stay focused and engaged. Prior to the testing our teacher made sure the students were relaxed and even encouraged talking with their classmates to “get it out” of their system. She explicitly told the students that they would be dealing with a challenging task that she knows they can and will succeed at if they use the skills they have been practicing. She then went on to review ways to stay focused and other test-taking strategies before the students begun testing. This emphasized the value of repetition in directions and strategy skills. During the following week, scores were calculated with the help of our ELA coaches. Our students came up thirty percent below what the district deemed to be the goal score. However, most schools across the board fell short of where the county would like to see scores so that made me feel a little better but still not without concern. With only about a month left before testing we are using the student data to guide our lesson planning. It is very useful being able to identify specific areas of improvement and then work as a team to implement the plans in place. As I reflect back on the past two weeks in my practicum classroom I realize teachers are held accountable for so much more then educating their students. While I expect behavior management to play a large role in the classroom it was not until after this week that I realized how much “busy” work is also demanded of teachers. It’s hard to believe we’re already two weeks into our second semester and have the opportunity to spend two full days in an elementary classroom. Unlike last semester where we were limited to time and opportunities to participate this year we will be responsible for lesson planning and administration, sitting in on meetings and conference nights, conducting a case study on a student and more time to learn from the teachers actions and performance. This week I finished the first two days and one of the first thought I had was that my comfort level was significantly higher then my first experience observing at the school. Of course I had time to develop a relationship with my coordinating teacher who I gratefully refer to as my mentor but I am also armed with more knowledge and practice. The more I observe and actively participate in the classroom in addition to studying and research the more confident I feel in my teaching skills and abilities. Bottom line, these opportunities are so beneficial to my learning and are effectively molding and preparing me for my full time internship this fall. Upon arrival I realized there is much to be done before the morning bell rings. My coordinating teacher is very prepared but random and unexpected tasks seem to pop up. On the first day there was a new student and on the second day the students had to take a countywide reading comprehension test so we were prepping the room and students. The phrase managed chaos comes to mind. The classroom I am in has two classes (AM and PM). I was able to jump right in with the AM class because we were able to work together during my observations last semester. After walking around and helping out with bell work we moved into guided reading. I sat in with a small group and the reading coach. The students were initiating book clubs so I was able to witness the start of something new. The reading coach reviewed reading techniques referred to as reciprocal teaching (predicting, questions, clarification) and had them write out notes to create a folder. These would be used to help guide students through the readings as well as provide them with talking points during their book discussions. For the next rotation, I was trusted to lead my own group. I got to take the group to the reading coaches room where I helped them pick a book for their book club. It was nice getting to explore the resources the school has for the students and teachers and the kids appreciated the “field trip”. Unfortunately, I did not get to finish the entire preparation before it was time for the students to go to specials but I did feel the instruction and participation was thorough. When the PM class came in I had to formerly introduce myself and advised them that they could call me Ms. S. After introductions my coordinating teacher used my last name to do a quick “lesson” on how complicated the English language can be. She wrote school and Scholl on the board and had them sound out the differences. She then ended the conversation advising the students to call me by my full and formal last name. I thought her approach was such a great way to teach students about the difficulties of language and to help them learn how to pronounce my name and recognize me as a professional who should be identified formally and respectfully. I imagine I will introduce myself in the same way she did as I get my own classroom and students. Another moment that I would have liked to improve on took place when I responded to a student with “because I said so”. I always hated that phrase because while it may suggest that I have power in the classroom it lacks explicit reasoning and therefore seems ineffective to me. However, it slipped out of my mouth and left me thinking about what I could have said. One idea I came up with is “because these are the rules we have established”. I’ll still think of other things but I really do not want to be a teacher who runs her classroom like a dictator. We have a lot ahead of us this semester and I know I’ll be learning so much! I look forward to sharing my trial experiences and thoughts as I continue down the road to becoming a successful and effective teacher. Goodbye, Ruby Tuesday! Wrapping up 2014 and Anticipating 2015! For my final blog I will attempt to review a few select but meaningful concepts and ideas that we have learned throughout the semester and discuss how I will try to apply them in the future. As we gathered for our last Morning Meeting excitement seemed to be radiating out of the group. Today was our final day in Classroom Management and while our cohort will meet again next semester a three week brain break is both favorable and bittersweet. We have spent this past semester building our Morning Meeting leadership skills primarily through trial and error but also through narrative and research-based text. What I gained out of todays Morning Meeting has not been something I’ve witnessed or read about. Today I learned that there will be times and circumstances that lead to fluctuation in the manner these discussions are led and carried out. We covered current events that are both emotionally and politically charged which led to many opinions be shared and concerns being raised. As our professor (and the majority of us would agree) felt this was an urgent topic that deserved more time to cover than the normal rigidly structured Morning Meeting suggests. By deviating from the structure of our Morning Meeting I felt a deeper bond with my peers..it was as if we had evolved into a group of deep thinkers who could share potentially differing ideas effectively. For my future teaching strategies I will strive to develop my Morning Meeting practices into something that not only provides students with structure and consistency but into something that when needed can be altered without causing a disturbance or challenge to the bunch. While I do understand time plays an integral role in the classroom structure and that planning is crucial in facilitating lessons it is equally as important to me to know that there will be times in which subject matter can overrule the clock. Once released from Morning Meeting, our class was structured using a cooperative learning style. True to form, our professor grouped us for scenario practices using a little colored plastic frog as the determination of who goes in what group. Each group was matched with the other three students who had the same colored frog. In the past weeks our professor distributed the colored frogs either randomly or with intent but either way without any input from us (the students). What differed in her style today was that she used a more teacher guided/student led approach. She allowed us to select the frog of our choice; presumably knowing that we knew we would be partnered with those whose frog color matched ours. While many educators feel that students grouping themselves only leads to a greater likelihood of problems; others recognize the value of putting students in a position in which they’ve been conditioned to a set of expectations and trusted that they will honor and uphold these. Allowing students to group themselves is acceptable and can teach accountability but not until the students have had substantial experience working in mixed and diverse groups and have a thorough understanding of their group work learning expectations (Weinstein & Romano, 2015). In other words, students must earn the privilege of selecting their own groups by proving their willingness and ability to effectively navigate and learn during the cooperative learning structures. I will make a conscientious effort to teach students the value of group work which is heavily backed by the research of Vygotsky and numerous others from the modern trends of education. By helping my students to recognize the value of working with not only their friends but also with the diversity of culture and experiences their peers have to offer I can establish an environment in which students are allowed choices and flexibility. The last topic I will cover today is the idea of power base structure in the classroom. Let’s recap this concept! According to Levin and Nolan (2014), “The effective teacher is aware of the type of power he wants to use to influence student behavior and is also aware of the type of power that is implicit in each of the techniques available” (p. 84). One thing I have noticed about the teachers I find myself inspired by is that they are thorough and consistent and quite aware of the behaviors they exhibit. I assume this is not always the case but their confidence would make nearly anyone believe it so it works. During our group work the professor made a request that reminded me of her referent power. She politely but firmly asked if we could use our “group work” voices as the volume had become so loud she could not hear what the students in the group she was working in were saying. (Let’s all keep in mind it was the final day of the semester so if you can imagine the volume in the classroom was uncharacteristically loud) As soon as the words fell out of her mouth, everyone honored her request and I wouldn’t be surprised if other students were just as grateful she asked the favor because it had become unusually loud. When students willing carry out teacher’s request its usually a matter of the amount of respect they have for their teacher (Levin and Nolan, 2014). I know that my future students may not be able to identify why I apply the strategies I will in the future in the same way I’m learning to do in this program but thats irrelevant. What will matter to my students is how I make them feel and I how I engage them in learning. I hope to achieve a level of respect from my students in which if the classroom volume becomes so loud I cannot hear some of my students and I acknowledge this to the group that they will WANT to tone it down. I have so many memories in which students would laugh at teachers requests or feel forced to act a certain way and in both situations the opportunities for deep and meaningful learning were disturbed. It has been a wonderful semester. I have had the opportunity to work with expert teachers and dedicated professors in addition to the students at the elementary school where I’ve been able to observe at. I didn’t realize the capacity I had to learn so much detailed information in such a condensed period of time but I’m without a doubt coming out of this semester confident that I know more then I did at the beginning and that I will learn so much more which will shape me into becoming the teacher I envision for myself. Levin, J. & Nolan, J. F. (2014). Principles of classroom management: A professional decision- making model, (7th ed.). Boston, MA: Pearson. Weinstein, C. & Romano, M. (2015). Elementary Classroom Management. New York, NY: McGraw Hill.